Most popular size, best color selection. Great for lightweight and middleweight sewing. Use for furniture, leather, gear, garments, upholstery, drapes. Largest size for most home sewing machines. 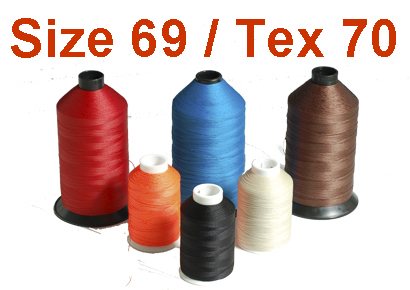 Size 69 (Tex 70) nylon thread is our most popular size, and has the widest color selection of all our sizes. Use with a size 100/16 to 110 /18 needle.